Top class villa! Stunning sea view panorama! Private pool! Promotions: 20 % discount for all bookings in May, June and September. Villa Infinity sits in the heart of a prime villa area and offers one of the most extraordinary panoramic views overlooking Albena Resort and the sparkling Black Sea, providing an inspiring backdrop for your family or friends holiday. Distanced only about a kilometer away from the sea and about 3 km from one of the most popular sea resorts in Bulgaria - Albena, it offers a great range of modern facilities for a complete and exciting vacation on the Black sea coast. This holiday home provides exceptional comfort for 12 guests who appreciate luxury and convenience. Right from the entrance, the house will surprise you with its sunny colours and stylish interior decoration. But the real "WOW" effect comes when you first step on the verandah. 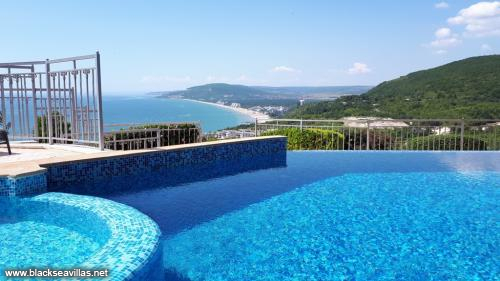 The views towards Albena resort, the golden sands and the clear sea waters would envy many Hollywood stars. Villa Infinity is set on three floors and offers 6 separate bedrooms (5 twin bedrooms and a lovely spacious master bedroom on the top floor), 3 bathrooms (one with bath and two with shower) and a spacious living room combining a fully equipped kitchen area, dining and lounge sections. Each of the bedrooms is furnished with a wardrobe (or dresser), bedside tables with reading lamp, dressing table with chair and mirror. All bedrooms are air-conditioned and have an access to a terrace (except the children's bedroom for security reasons). On the ground floor are located the living room, one twin bedroom, shower-room with WC and a wet room. On the upper floor you will find 3 bedrooms, each with 2 single beds that can be put together or divided according to your preferences and the second shower. On the top floor are located the en-suite master bedroom with a double bed and the bathroom, as well as the children bedroom with two single beds and a sloped ceiling. In the kitchen on the ground floor at your disposal are: refrigerator combined with a freezer, dishwasher, 4 electric hobs, oven, extractor, microwave, toaster, coffee machine, el. kettle. Next to the kitchen area is located the dining table with comfortable 8 seats. Under the covered verandah with gorgeous views to the sea you will find garden furniture with additional 12 seats for your amazing alfresco dinner. The owners have provided for the good party mood of the guests - 42'' TV with satellite channels, CD player and DVD - are available in the living room, so do not forget to bring your favourite movies and music CD's. In an additional wet room on the ground floor are provided a washing machine, iron and ironing board - very necessary facilities for groups with small children. The place where you will spend unforgettable moments with your friends or family with certainty is the verandah which offers an incredible sea panorama towards Albena resort by day and night. Even during the hot summer days with a cold cocktail or in the warm spring nights with a glass of white wine and in the cool early mornings with a cup of hot coffee the sea view always reduces the stress piled in the daily round and recharges the batteries for more cheerful mood. In the landscaped garden of Villa Infinity is located the swimming pool where you will find the desired coolness after hours under the summer sun. 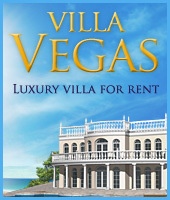 Notes: Villa Infinity is fully air-conditioned. A small safe and house security system available. Movable BBQ available. One parking space in the yard. Option for parking 1 more car on the street. Please, bring your own beach or pool towels. - The beautiful Albena resort is the second biggest beach resort on the North Black sea coast in Bulgaria. With its 17 tennis courses, a riding club with 30 horses and 2 arenas, 21 outdoor and an indoor pools, a yacht club, fitness centres, playgrounds for beach volleyball, bowling hall, a centre for paragliding, parachute jumps, plenty of restaurants and bars, Albena resort has a lot to offer for a full and completely vacation. The resort is situated only 30 km away from Bulgaria's sea capital Varna. It is remarkable for its 6-km long beach. It has 43 hotels (2 to 4 stars), situated at the very beach or at the picturesque hills with exciting views of the sea and the “Balata” National Reserve. - Varna is Bulgaria's third largest city. It was an inhabited place even before the Greeks established the colony of Odessos there about 580 B.C. Later, under the Romans and their successors, the Slavs, Varna became a major port trading with Constantinople, Venice and Dubrovnik. Nowadays it is Bulgaria's main naval and commercial shipping port. It's also becoming a magnet for tourists, being adjacent to the coastal resorts of Golden Sands, St. Constantine and Albena. A university town, it is has a cosmopolitan atmosphere that will immediately impress visitors. Boulevards lined with 10th century buildings provide an attractive backdrop to the fashion shops and sophisticated cafe bars. - Golden sands - the biggest summer resort on the North coast of Bulgaria with glorious scenery, wooded hillsides sweeping down to meet one of the world's most beautiful beaches and the blue sparkling sea. The beach is 3.5 km long and its width is up to 100 m in some places. With the average temperature of the air is 27° C and that of the water 24° C, Golden sands is the right place for sea- and sunbaths from May to October. Distanced only 18 km from Varna city and about 25 km from the internation airport, the resort offers great variety of entertainments for all ages - parents with children, youths, elderly. - Aladja monastery is the most famous rock monastery at the Bulgarian Coast, one of the many monc cloisters, existed in 13-14 century. - Dobrich. Due to its generous land, the area of Dobrich town is called the ‘Granary of Bulgaria’. Dobrich is the eighth most populated town in Bulgaria, being the centre of the historical region of Southern Dobrudja, and is located 30 km west of the Bulgarian Black Sea Coast, not far from resorts such as Albena, Balchik, and Golden Sands. Some of the sights in Dobrich are the museum of Yordan Yovkov (great Bulgarian writer), the "Old town" of Dobrich with different handcraft workshops, the ruins of a Middle Ages settlement, the ancient necropolis and a big number of monuments. - Baltata Forest Reserve. Very close to the resort (bordering "Albena" and stretching west to Kranevo Village) is one of the few dense forests, which have been preserved -Baltata preservation area or 197 hectare wildlife area. The forests of Baltata reserve are actually made up of many interesting habitats because of its proximity to the sea. Found in the reserve are deer, wild boar, red fox, steppe polecat, wood ducks, herons, falcons,etc. as well as numerous representative flora supported by this unique ecosystem. Visitation is encouraged but only with specially arranged tours and guides. - The holiday village of Kranevo with its remains of the ancient fortress used in Roman times and the Middle Ages is also located in very close proximity to Albena resort. Beside the fortress, the village is also attractive for its mineral springs. The coast between Albena and Kranevo is high and extremely picturesque with steep rocky formations.